This site is located in a residential area in south county Dublin with the new house replacing a 1970s bungalow which existed on the site previously. Key to this design was the client’s requirement for the new house to be energy efficient, cheap to run and to make the best of his site. The form, layout and detail of the house result from these requirements and were guided by best principles of sustainable design. The use of natural light is integral to the project. The house is orientated east west and is kept tight to the north boundary to open up the south facade of the house to the sun. A double height circulation space is situated in the heart of the house, linking the two floors. All the rooms open off this central space which utilises the stack effect to naturally ventilate the house. 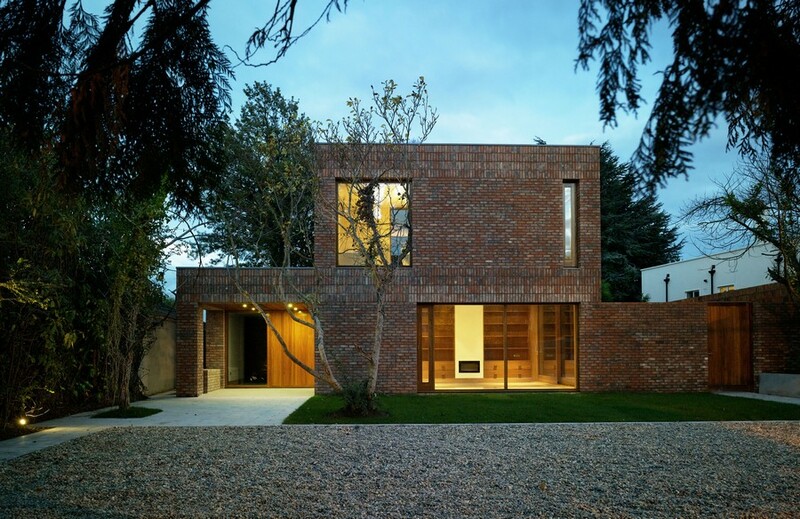 The south façade has then been composed using full-height triple-glazed iroko windows and sliding screens to maximize the solar gain. The east, west and north façades are exceptionally thermally efficient. While the house is 250m² in size, it is an efficient and compact volume. The local planning authority have a policy against demolition of existing buildings on the grounds of sustainability. This constraint was circumvented with the argument that re-use of the existing bungalow would prove less sustainable than its replacement. Using the design and energy reduction measures of super-insulation, air tightness and heat recovery, etc, it was proven that the new house results in increased energy efficiency, reduced primary energy usage, reduced CO2 emissions and thereby on the grounds of sustainability is completely appropriate. The house is a combination of the best of both new and traditional construction technologies. The house is a prefabricated timber structure wrapped in brick and timber sitting on a polished concrete plinth. The choices of material and technology were driven by constructional and economical logic. The client was prepared to invest in materials and technology that would reduce the long term running costs of the house. The design process began in April 2009, planning permission was granted in Dec 2009, tender documentation was issued in June 2010 and the construction started on site in October 2010. The house was completed in September 2011 after an 11 month construction period.